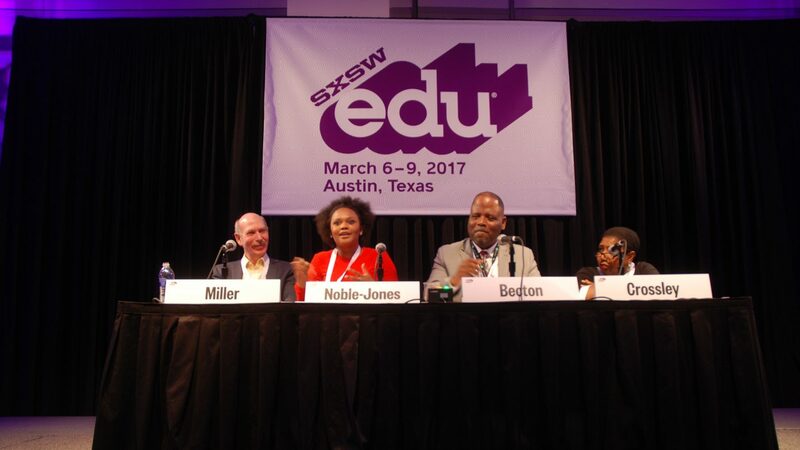 SXSW EDU brings together thought leaders and diverse viewpoints to collaborate and explore crucial topics in the world of education. On the heals of this year’s Conference & Festival, we are reflecting on the dynamic conversations and ongoing dialog sparked by this year’s speakers. Audio recordings of the 2017 sessions are available to listen to at soundcloud.com/sxswedu. Event registrants had the opportunity to provide feedback on each of the sessions that they attended. Below are five of the highest reviewed sessions from this year’s event for your listening pleasure. Whether you are an avid podcast consumer or just looking for a little inspiration, this is a great starting point for your SXSW EDU listening journey. And know that we’d love to hear your thoughts; keep the dialog going by sharing your comments, thoughts and reactions on twitter. The fatal police shooting of Michael Brown in Ferguson, Missouri, in 2014 and its aftermath ignited national debates about race, policing and justice in the United States that continue to this day. These events also provided fodder for rich, meaningful discussions about the credibility and impact of mainstream news and social media in the digital age. Join Facing History and Ourselves and the News Literacy Project for a timely panel discussion about the impact of social media on the traditional news cycle; the role that confirmation and other biases play in how we interpret news and information, and our responsibilities as citizen watchdogs and civic participants in a democracy. Our domestic students are coming to college from schools and neighborhoods that are more racially segregated than forty years ago (Rothstein, 2013). Many of our students arrive on campus without much experience interacting with people of different social identities, and with even less experience talking about institutionalized marginalization based on these identities. In order to develop graduates that will thrive in a multicultural society and challenge systems of oppression, we need to engage our students in social justice conversations, starting with conversations about race. We have developed ways to do this at Boston University that you can replicate at your school. Your Privilege Is Showing is both a card game and an experience that enables participants to use real world examples of bias as catalyst for self and community change. This session will explore the YPIS pilot project that was done Fall 2016 with Berklee College of Music and share important findings related to student engagement around social justice conversations. In addition to giving the audience the chance to experience the game themselves, participants will further discuss why having these conversations are beneficial to supporting a more intentional environment for students to recognize problematic language and behaviors. Teaching the “4Cs of 21st Century Skills” in dynamic ways can be a challenge, as more weight is increasingly placed on test scores. Critical thinking, creativity, collaboration and communication are all inherently part of PBL, and innovation challenges can provide teachers with a framework for guiding students to learn by doing, and give students the freedom to innovate within the curriculum.Panelists from three innovation competitions will share how they create free lesson plans and resources to enhance experiential learning. Alexis Lewis, a teenage patent owner who has won numerous invention/innovation competitions and spoken at The White House, will give some insight into her experiences. We struggle getting students genuinely interested in learning mathematics. Using popular music as the foundation, a district Math Coordinator, his teachers and students work to create songs related to math. Further, they then create music videos and share to make math joyful. This session will share parts of the music videos and then share strategies for teachers to make their own videos in the classroom!